Once again the high energy Sundad team of John Eurell, John Eurell Jr. and Chet Soares take to the studio and come out with a remarkable album of World guitar compositions with enough ensemble to make a treat for the ear. 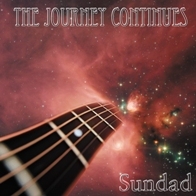 If your day has been rough and you need a lift or you just want to get the evening started, then Sundad is your band. The new album The Journey Continues is ten tracks of father and son acoustic compositions that are powerful, energetic and unforgettable. Between father John Sr. and son John Eurell Jr. they probably have over fifty years of guitar playing experience. They blend their unique music style with a mixture of rock and jazz; throw in a little funk and now and then add a few flamenco guitar licks. Eclectic? You bet. Entertaining? Without a doubt. Finally, put in Chet Soares brilliant percussion with a decidedly Latin beat and you have – Sundad. The first cut, The Veil, is deceptive. It starts out with a mellow rift of sparkling guitar and bass courtesy of guest artist Eddie Denise and then POW! This sweet tune turns into a quick tempo samba full of great fretwork and banging gongs. What is behind the veil? It is the entryway to a journey of discovery. Not just for the artist, but the listener as well. It is not only a doorway, but also an invitation to join along with the musicians and I for one, accept. Out of Body is a mystical expedition unto itself. It has a smooth jazz feel and a good flow. Great drums by guest Abe Speller and Chet puts in some good congas. I imagined I was on a fast sailing ship, the blue water gleaming, the sun shining on my face and having the time of my life keeping up with the wind and frankly, I never left my living room. Sultry Spanish guitar song fills the night air in the ballad The Conquistador. This is tribute to the great explorers that traveled the Caribbean Sea during the sixteenth century in search gold and fame. Along the way, they kept their eye peeled for the Fountain of Youth. It was not long before South America would draw their attention and the search renewed. The Midnight Express is one of the most underrated modes of travel. Fortunately, Sundad, along with Dave Kline on violin stirs up the dust, breaks ground and leads us on a foray that will not end until the light of dawn illuminates the day. This tune is reminiscent of a Crosby, Stills and Nash song and something I compared them to in my last review. I call this one my favorite. Here comes the funky part. The song Were You There has a quirky lead and a great beat. The odd title may be a question and maybe not. It has a kind of "we are them and they are us" feel and the puzzle remains unsolved. Remarkable musical duet with a spiraling lead that takes you back to the beginning. One of the best on The Journey Continues. Sundad has garnered several Best and Best Acoustic nominations and it stands to reason. Their harmonies are complex, but always accessible to the listener. You can sit back, relax and let the music flow and you will pick up on the energy within seconds. Whether it be a party of one or a hundred, this is the music you want in the background. Feel free to turn it up.